A resurgence of the thoroughly debunked “Dendera light bulb” and the “Baghdad battery” pairing has started making it’s way through Facebook lately. Its as if the internet ran out of crazy ideas and is recycling old ones. Or, more likely, a new generation of the gullible is learning to spell and is now making it’s way down the path of Big-Woo, where shills are pushing new comers to spend their money on books and videos. Ancient Egyptians had light bulbs powered by batteries made of jars that they ostensibly received from space aliens. There is a panel comprised of five stone reliefs in the Temple of Hathor in Dendera, Egypt that shows the mythical depiction of lotus flower spawning a snake held aloft by a djed pillar. The lotus is the symbol of creation, life, and birth in Egyptian religion and spirituality (Pinch 2004). A djed pillar is the symbol of stability and endurance. The snake represents Ra’s serpent form being created from primordial waters. The field surrounding Ra’s snake form is referred to in ancient Egyptian literature as protective magical energy in liquid form that all gods and pharaohs possess (Faulkner 1970). The Temple of Hathor, where the panel is situated, was constructed during the Graeco-Roman period at about 332-395 CE, and is one of the best preserved temples of the period in Egypt. A large hypostyle hall leads to a smaller hypostyle hall, which ultimately ends at the sanctuary. 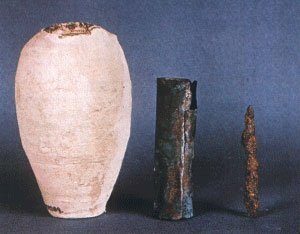 The so-called “Baghdad battery” is actually a set of artifacts that were discovered in the 1930s near Baghdad, Iraq–1,725 kilometers (over 1,000 miles) from Dendera, Egypt. At about 14 cm tall, the “battery” is actually a ceramic vessel that contained an iron rod and some rolled copper sheet. Little information on the provenience of the objects is known, so precise dating and an exact location are vague. The date range of the artifact is somewhere between 250-650 CE. Originally, the person that found them, Wilhelm König, thought that they could have been early examples of galvanic cells used for electroplating. This was a speculation, which he recognized as an hypothesis, but there was never any evidence that this is what these clay pots were used for. The acidic residue that König found in the jars could well have been the remains of papyrus and the corrosion of copper and iron rod. The idea might have been to protect documents, preserving them for the future. Another possible use may have been for ritual or “magical” use in which a participant kissed or tasted the tingling sensation of an object. 1) Glass bulbs. We see none. Egyptians were fairly adept at creating glass for beads, the earliest known glass objects, during the 18th Dynsasty (1543-1292 BC). These were probably created as slag by products of metalworking. But the type of glass needed to make bulbs of the type in the space-aliens claim isn’t found in the archaeological record of Dendera at all, though glass-blowing is typically considered to have begun by the 1st century BCE in the Levant. 2) Batteries. None are found in Dendera, which is over 1,000 miles from Baghdad where the alleged “battery” was found. And this is no trivial expectation because, in order to make lighting via electricity more effective and efficient than using torches, the amount of batteries that should be found in the archaeological record of Dendera should be in the thousands. Yet there are none. Not a single one. 3) A lack of soot. Since there was electricity and electric lights, we should not see soot on the ceilings of the Temple of Hathor. Yet we do. The ceilings and walls were covered in soot. In fact, a recent effort to clean the soot from the ceiling in one section revealed a fantastic and previously unknown mural underneath. 1) If the batteries were alien, why the clay jars? 2) If these were remnants of a so-called “high civilization” that no longer exists, why no wires, glass bulbs, and additional batteries at the site of the Dendera Temple? 3) What ties the baghdad batteries, 1,000 miles away, to the Dendera temple? Why should we think that the technology was shared between two rival states so far apart? 4) Where are the other uses for batteries in the archaeological record: the lights at other sites, the motors, etc. Faulkner, R.O. (1970). Concise Dictionary of Middle Egyptian. Griffith Institute. Because light bulbs have nothing to do with aliens? Then we’re in complete agreement! But seriously, when you say “very biased,” it means there’s something to talk about. What biases am I guilty of? I guessing you think these symbolic pictographs are actually some sort of “light bulb,” just not alien in origin. But just because *you* don’t think this way doesn’t mean that others share your position. There are many who think this is *precisely* what’s going on. I do have a bias, of course. As do we all. My bias is, hopefully, with data and evidence. Because you took the time to leave a comment, I have to assume you feel the same way. Let’s talk about it. I’m definitely willing to change my mind given sufficient evidence. Thanks for leaving a comment! I genuinely appreciate it!